Every year new students are inducted into the International Thespian Honors Society. Inductions went off “without a hitch” according to junior Mattie Ocker. “Being inducted really means a lot to me because my stepfather was in the International Thespian Society too; he has the same pin as I do so it was really special to me,” Ocker said. Other inductees had a different idea of how the ceremony was special. “I’m really honored to be a part of the same Honors Society as Madonna and Tom Hanks,” senior Johnathan Spell said. Freshman Anna-Gray Anderson was so happy at the ceremony, she could barely find words to describe the experience. Anderson thinks that International Thespian Honors Society is important because it’s a step up from theater class or drama club. people very devoted to theater,” Anderson said. 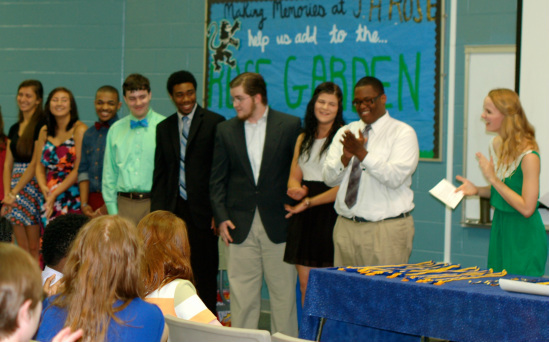 All new inductees stood at the front of the room to recite a pledge so they could receive their honor. Smiling while their parents took pictures, the thespians promised to uphold the aims and ideals of the society. After the pledge, upperclassmen came to give the honorary pins to the students. A few got teary eyed as they gave pins to their friends. “Mrs. Edwards inducted me and made me feel really special,” Ocker said. Elessa Butler, Rose Class of 2003, came and spoke to the inductees. Butler was very involved in theater when she was at Rose. She told a few stories of her time in theater and her various rolls. She spoke about camaraderie and the bond made between fellow thespians. Butler was very happy to tell students that she is still in touch with a few friends from highschool because they became friends in theater. Butler is no longer pursuing theater as a career but encouraged the young thespians to follow whatever dreams they had. Apart from inductions, drama teacher Monica Edwards gave awards to those who were voted the best in the various plays. There were tech awards, ensemble awards, supporting actor awards and lead actor awards. Edwards’ way of doing these is different than some would expect. No medals or trophies were awarded, instead Edwards gave small gifts that represented the person receiving the award or the character they portrayed. Spell received a smurf toy as a gift; his on stage girlfriend, Julia Bradley, receiving a smurfette. Mia Connell received pom poms for her performance as Patty Simcox. “I think its nice that [Edwards] makes it intimate with the gifts,” Connell said. Including the student votes for awards, Edwards gave out a few awards as a Director’s Choice award. “I got the Directors Choice for It was a Dark and Stormy Night for my progress in my acting from last year to this year,” Ocker said. Senior Sterling-Wolf Ayers got a very special award along with a few minor ones, his medal for work in theater being his favorite. Many awards were given and received with smiles, and a few shed tears. Edwards teared up speaking of her students graduating and those moving away. Ocker and Anderson all look forward to next year.